Crystal Cut to Clear Wine Hocks & Decanter. 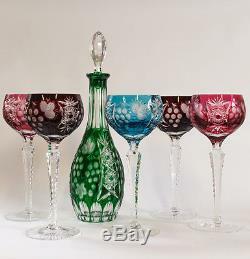 This set of 1 cobalt blue, 2 ruby red, 2 amethyst purple wine hocks & 1 emerald green decanter has a beautiful cut grapes and star motif and is in perfect condition. Part of a collection that was never used it can be considered as good as new. The glasses are 8"high and 3"wide. The item "Crystal Cut to Clear Wine Hocks & Decanter" is in sale since Wednesday, March 23, 2016. This item is in the category "Pottery & Glass\Glass\Art Glass\Bohemian, Czech\Other Bohemian/Czech Art Glass". The seller is "c3px3" and is located in Chappaqua, New York.